Last week Director Susanne Bier and Screenwriter Christopher Kyle were in London to preview their latest film Serena (as well as Bier's A Second Chance) to London Film Festival audiences and I was fortunate enough to be invited along to a roundtable chat with them - an opportunity I quickly snapped up and happily so, as it was a privilege to be in the company of such talented creators and as Serena has had as almost as much written about it as speculation on its history this only added to my eagerness to hear directly from the film-makers about the making of Serena. I'm not going to sweeten it - I struggled a bit with Serena. There is no denying that it is very much its own film a throwback to dark noir and doesn't pander to any expectations that may arise from the casting of a Hollywood golden couple as its leads. But wait! Maybe I should rewind a bit - let me start earlier - possibly my feeling towards Serena has more to do with my only frame of reference for the works of Susanne Bier her 2006 Mads Mikkelsen starrer - After the Wedding (Efter brylluppet). It is a remarkable and subtle piece of filmmaking wherein Bauer eschews technique to rely on her casts performances to tell an utterly compelling and original tale of; well optimism and hope - but even more surprising it that it is told in an unsentimental and realistic way. Something sadly lacking in modern film rosters. Even my wife who bears the brunt of my experimental cultish tastes was pleasantly surprised at how human and wonderful After the Wedding is. This is possibly part of the reason as to why I struggled as much as I did with Serena as it heads in the other direction, completely the other direction, so much so it took me by surprise. Possibly I'm a little more forgiving than some as Serena is dark and as close to the real spirit of Film Noir that we have seen on screen in a long time. And I have a strong affinity with the genre. Possibly my feelings about Serena have much to do with the fact that I have been waiting for it – ever since I heard Darren Aronofsky was helming it, creating certain expectations. But then Susanne Bier sat down in the Directors seat and all that changed and I was very interested to see what she made of it. Jennifer Lawrence and Bradley Cooper coming on board in roles playing against type made Serena one of my most anticipated film of the year and this year. The round table chat took place awhile back but I wanted to get a better context for Bier's style so Serena would have more relevance for me within her body of work - rather than trying to understand it in a vacuum. After all isn't all art understood with a deeper richness and meaning when you have a better understanding of the artist? Subsequently I have managed to watch two more of her films, despite a proper Bier fan recommending some gems like; another Mads Mikkelsen starrer Open Hearts, being remade by Zach Braff with Susanne Bier producing, the two I have managed to see so far were chosen based on ease of availability: Things We Lost in the Fire an American film starring Halle Berry, Benicio Del Toro, Alison Lohman & David Duchovny and Love Is All You Need (dire title but great film, a variation on the original title Den skaldede frisør - The Bald Hairdresser would have been much better) an English/ Danish language film set in Italy starring Pierce Brosnan, Bier regular Trine Dyrholm, Molly Blixt Egelind and Kim Bodnia. Both great films, with identifiable threads of Susanne Bier's tropes and themes running through all her films (I have seen) – family, grief, union, strong woman and a patriarchal figure who is ultimately just. Something else that is blatantly obvious is that Bier can certainly draw outstanding and subtle performances from her cast – in fact one of Brosnan's best in a good while. All of her films that I saw have shades of realism and a strong core of humanity running through them. Someone described her films as melodrama – this is a close approximation but I feel her films are a lot more subtle and offer genuine surprise with characters and plot roll-out. There is something both nostalgic and fresh about her films. Lumping them with the melodramatic fare that we have come to expect would be a mistake - given that fun, lightness and optimism seem to have taken a back seat to pander to a market that the “in for a penny in for a pound” profiteers believe will not appreciate subtlety or shades of emotion and if you “are going to do it you go all the way” leaving us - with an entire genre filled with big name stars but bereft of emotion or humanity - because the brash cut to the chase, cheap laugh or uncomplicated characters retreading the same tired plot is an easier sell to a wider audience. This is also the reason I give melodrama and romantic tales a wide berth. Chatting with Susanne may have actually alluded to this very thing above - but I didn't quite have the insight about the uniqueness of the stories she tells to fall back on at the time - so it took place at a fairly generic level for me - I really should have seen more of her films before chatting with her but misguidedly felt that After the Wedding and Serena would be enough to have a decent chat even though they couldn't be more different films. North Carolina mountains at the end of the 1920s - George and Serena Pemberton, love-struck newlyweds, begin to build a timber empire. Serena soon proves herself to be equal to any man: overseeing loggers, hunting rattlesnakes, even saving a man's life in the wilderness. With power and influence now in their hands, the Pembertons refuse to let anyone stand in the way of their inflated love and ambitions. However, once Serena discovers George's hidden past and faces an unchangeable fate of her own, the Pemberton's passionate marriage begins to unravel leading toward a dramatic reckoning. 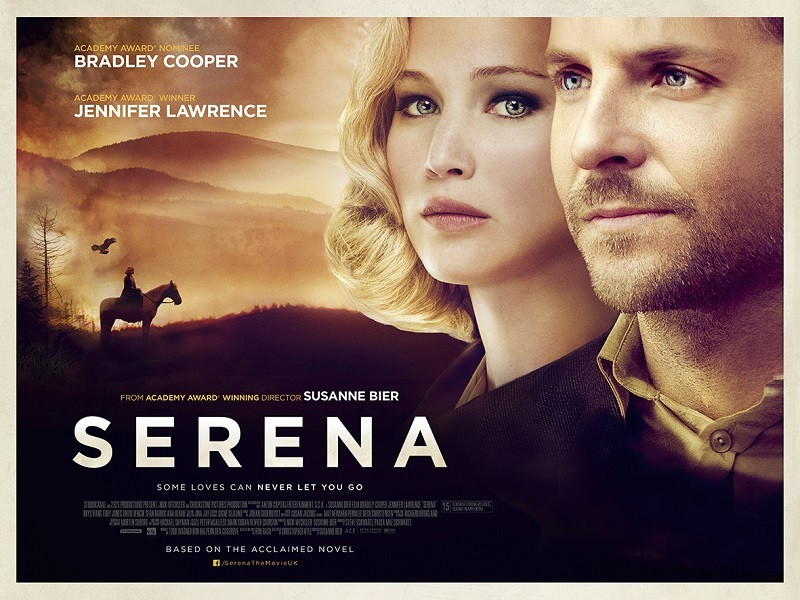 Taking place mainly in a small logging village situated in the great smoky mountains of North Carolina during the 1920s Serena is a real throwback to film noir so much so that I think that its suffers somewhat from being too much of the time depicted. Its sensibilities, the raison d'être of the potentially interesting set of characters and moods are very much of the period and many, like myself may struggle to identify with their motivations and world view - as the characters are not given enough to distinguish themselves or endear themselves to audiences beyond the leads. Ironically the personalities portrayed are possibly a lot closer to the reality of the simpler blunt times further pushed to the extreme by the rustic depression afflicted location these people inhabit. Serena starts off well with the pioneering spirit of enterprise and man forging his way into the future in a country ravaged by the Great Depression, its the American Dream and has a feel of The Fountainhead about it. Mainly embodied by George Pemberton (Bradley Cooper) a man with a vision, he knows what he wants and he wants it now! He is man who has through his strength gained loyalty from his partners and workers, in spite of the incredibly hazardous nature of the work they undertake. Despite increasing social and financial pressure Pemberton has clarity of vision and a grand plan. Into this rural pressure cooker blond bombshell Serena (Jennifer Lawrence) is introduced and shows herself to be more than capable to part of this tough environment - but slowly as with all noir femme fatales she wholly seduces Pemberton and slowly they slide down a very dark path wreaking havoc to all those who become entwined with them - as Bier once again explores familiar themes but with a much darker flavour this time. I believe that if Serena was in black and white and released 60 years ago it would have engaged with audiences a lot quicker despite possibly being a highly controversial and borderline subversive film, unfortunately modern audiences will probably expect a lot more complexity of the scenarios and characters. Somewhere in Serena is a great tale waiting to be told. SUSANNE BIER AND CHRISTOPHER KYLE ON WHAT DREW THEM TO SERENA. CG: There appears to be recurring themes in your films and I was wondering about what draws you to the films you undertake. Christopher Kyle: With Serena I was taken with the sheer darkness of the story and the novel. The path it goes down dealing with how people deal with nature, how people can love something and want to destroy it at the same time, how the love between the two characters turns into a dark possession that goes way beyond the passion that it starts out with. Those are big epic themes and as a writer it is very exciting to work on that, and it doesn't have very often as so much of what is happening in Hollywood at the moment is comic book or toy related. CG: Yea, Serena really does feel like a throwback to Film Noir in its original form. To deal with these kind of characters is big for me. The novel was inspired by Shakespeare and Medea and that filters into the story and makes it very exciting to work on. Susanne Bier: I get attracted by characters. I think that's what intrigues me. In Serena there are a number of very interesting characters and the two main characters and their dark love story immediately attracted me. As well as the world, the men's world of the logging camp and this strong woman venturing into that world I found utterly fascinating. CK: Serena seems to hark back to the golden age of Hollywood, it is epic looking - with Jennifer and Bradley looking like they stepped out of the old school Hollywood 30s or 40s - and an epic story but it is very human story that is contemporary. Is the human side something that attracted you? 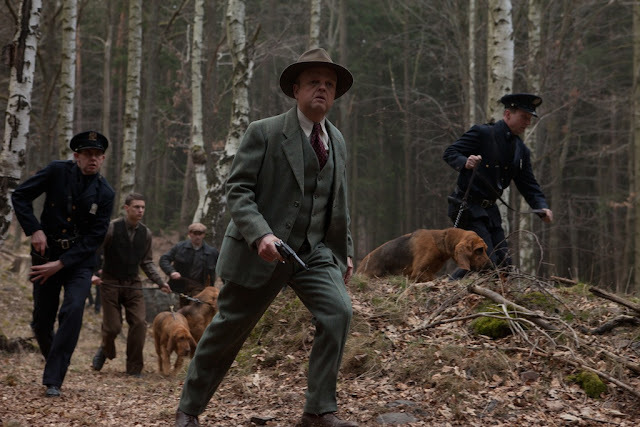 Susanne Bier: The script is epic and it has a definite noir element to it. I think what makes it human as opposed to classical noir is that there is an element of psychology to it. Christopher Kyle: Also it is more from the view of the woman usually in noir, the woman is just a monster who drives man into disaster but with Serena you get more insight into who that femme fatale is. Susanne Bier: I think that is what makes it more human, that you understand her even if you don't like what she does. CHRISTOPHER KYLE ON COLLABORATING WITH SERENA AUTHOR, RON RASH. CK: Serena is based on a book by Ron Rash – did he have much input in the script? Did you collaborate? Christopher Kyle: Well, he didn't want to get involved in the adaptation. I find that working with novelists – you know the old Faulkner story: “just throw the money over the fence and run”. 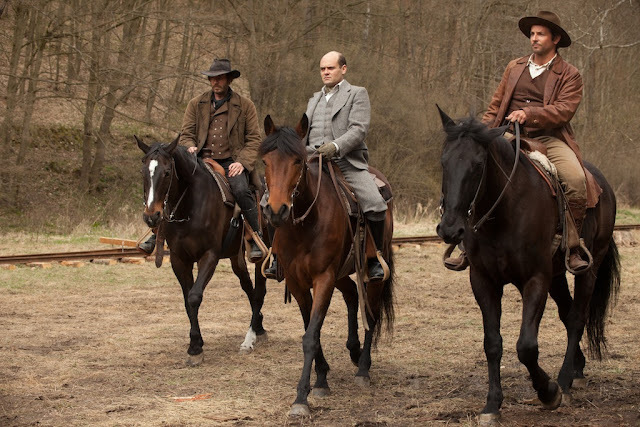 But he was extremely helpful when I was trying to understand the period – the way the logging camps worked – the way the people were in that time. He, of course, had done a tremendous amount of research to write the novel. He sent me a big box full of all this stuff he had done and it was really helpful in bringing that specificity to the world. So in that way he was extremely helpful and supportive all through the process. RC: Serena is in English whilst A Second Chance is in Danish - how different is it to direct films in languages other than your own? Susanne Bier: I don't actually feel it is is very different. Ever since I was a kid everything I have read has been in English. I think the big difference in films has to do with the budget. When you go above a certain budget things become way more complex. When movies are very small you have complete autonomy, for better or worse. But the opposite is also true – so for hugely successfully, exciting or expensive films there is a tendency or rather a danger that films becomes less distinct. Because there is more at risk. RC: Were there any changes on the script once you were on set and did this lead to conflict whilst working together on the script? 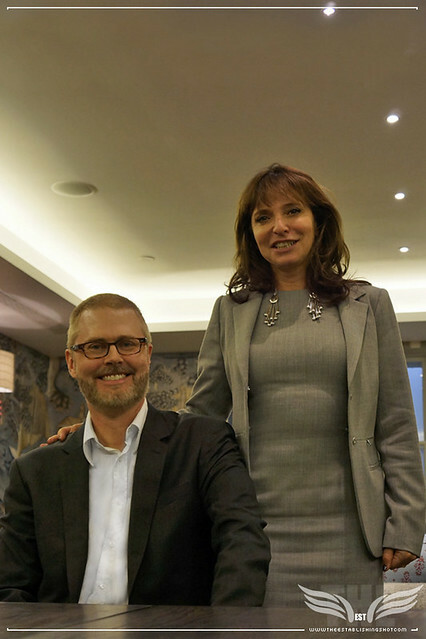 Susanne Bier: We aren't talking anymore! Christopher Kyle: I honestly don't remember any arguments. Certainly any that were heated. We may have had extensive discussions about a scene or something here or there. But no I think we were quite simpatico from the start on the script and where it needed to go. I did work in pre-production to tailor the script to the set and actors right before they started shooting but after we started shooting we didn't touch anything in the script – did you? Susanne Bier: No. But I think something that was interesting - was at which point did financial restrictions impact the script? I have been thinking about it since you asked about doing an English language film as opposed to a Scandinavian film. In Scandinavia we are very very used to working with financial restraints and its something always in the back of our minds. Particularly in America and to an extend even in England it's only in recent years that the budget doesn't organically stretch accordingly. We were able to make some later changes but I think it is an interesting consideration and cultural difference. RC: Can you tell us about the casting of the films stars and what they bring to their roles? Susanne Bier: I wanted Jennifer to play the part after I saw her in Winter's Borne and at the time it was actually a bit difficult to convince financiers that she was the right choice - which added to the delay – in the interim of persuading financiers, getting Bradley on board who was and is a big star and slowly getting the finance - together Jennifer had done The Hunger Games and then Silver Linings together. So it was actually the other way around, it wasn't like we were aiming for them because they were big stars we gathered that they would have a great chemistry together which Silver Linings proved. CG: Just to jump off from that, something phenomenal about your films is the casting of talent – I'm not just referring to star power but real talent. Had do you go about casting and what is it that you look for? Susanne Bier: Intensity! I think what I look for is Intensity! Insensitivity in the case of Bradley and Jennifer also comes with great beauty, great charm and intelligence. But I think on the whole what I am looking for is intensity. The intriguing thing is there are great actors who do not necessarily have intensity and there are people who have amazing intensity but are not natural actors. It is a weird thing. In the rare cases they merge and that's when you get huge stars. CG: I know it's difficult to quantify but how do you gauge that level of talent? How do you know is it something you see in their past performances or is it more about meeting them face to face? It's just that you seem to draw out an exceptional depth of performance from your cast in your films that's why I am so interested. Susanne Bier: I hate to say that - I just know - but it's something I guess a little bit like a singer that has a certain voice. Like in A Second Chance - Nikolaj Coster-Waldau, plays the main character opposite a model [May Andersen] and this is her first and only role. I met her at a party, she is a well known model and I knew I wanted her to be in the film. I didn't want her to audition because I knew just as sure, she would do a horrible audition. So I wasn't going to go through an audition, have discussions and a lengthy process. I wanted her to be in the film so went in absolutely certain it would work and it does work. She has an immense intensity, I don't know if she is an actress but she works in that part. CK: Would you say it's instinctual? Susanne Bier: Well it also helps to have experience. You might have a voice but if you train it enhances it - so experience helps. IG: You mentioned some of the themes of Serena are love and obsession, how entwined are the two? Are they the same? Susanne Bier: I think it clearly starts out as a love affair and it becomes, particularly from her point of view a delusional obsession. It doesn't mean that she doesn't love him anymore but I think she is utterly misguided in what could make love sustainable, from that aspect there is a clear parallel in their relationship to nature. The think they can own the world, control nature, destroy it – off course they can't. In the same way she can't destroy something he has to love, but she considers a hindrance – she can't destroy that and maintain the love - so I think there are clear parallels. I do think their love is obsessive, not in the beginning, you might say they have an obsessive sexual attraction but I don't think that is the only element. I think their love is way deeper than that. CG: Serena seems to have come with a fair amount of history attached to it. I'm unsure what is speculation and what actually transpired but my understanding is that Darren Aronofsky was involved at some point and that it has taken two years from shoot end to get Serena to screen. Can you fill us in on some of the history? Susanne Bier: Talk about delays Jennifer and Bradley were attached before she did Hunger Games and they did Silver Linings Playbook together. Any project comes with some history, so Darren Aronofsky involvement early on is no exception. Serena has been in post production longer than most movies and that comes down to a few reasons; one of them being that editing took longer than anticipated, that may have been a significant delay but not an outrageous one. But given the crazy schedules of the team involved particularly; Bradley Cooper and Jennifer Lawrence. Even doing the Automated dialogue replacement which was so important because it is a period piece, and there were so many technical considerations, like some of it was shot from a plane. So it was quite an extensive ADR to undertake. We had five days of ADR to finalise. Jennifer Lawrence didn't have two days off in two years. As you mentioned earlier I had another film to undertake which is here. So it became very tricky and there was a domino effect once it started rolling it became practically impossible, in the end I was kind of looking at the post production plan and laughing. Are you serious ADR eight months? So it wasn't one reason and I'm not pretending it was a piece of cake but in the end a small delay led to significant delays. CG: Earlier Christopher mentioned nature and I guess that may be part of what I'm trying to get at – there seems to be a bit of animal symbolism, which is something I noticed in After the Wedding – is that something you are drawn and may present further? 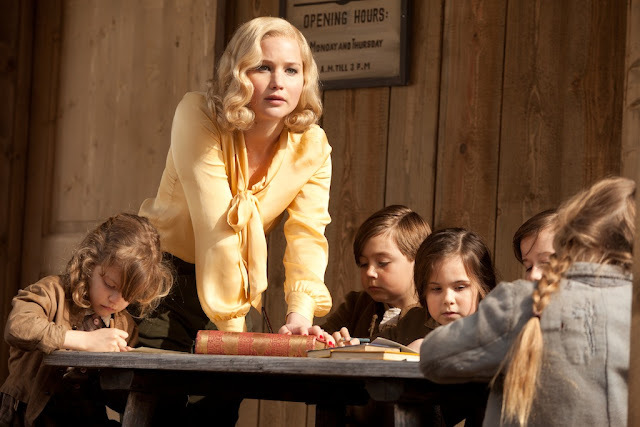 Susanne Bier: Well the panther was in the book. In After the Wedding it came about because of the house we were in and it became a natural part of it. I don't think it is my natural tendency to use animal symbolism but it could be interesting, but its not a natural path I would go down. 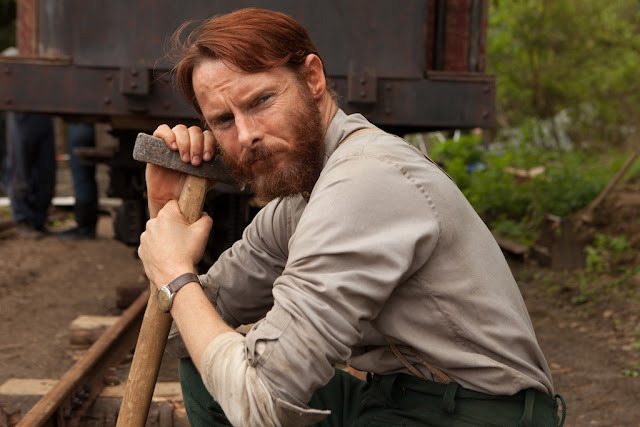 Reuniting Academy Award Winner Jennifer Lawrence and Academy Award Nominee Bradley Cooper on screen, SERENA boasts an incredible supporting cast in Sam Reid, Rhys Ifans, Toby Jones and Sean Harris.